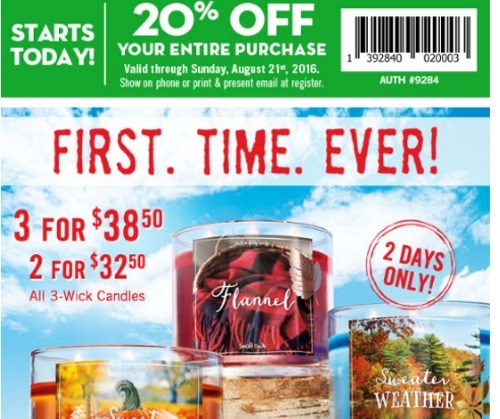 Bath & Body Works has their biggest candle sale ever and a new coupon! Save 20% off your entire purchase! Plus get their large 3-wick candles for 3 for $38.50, or 2 for $32.50. Plus add the coupon for more value savings! Offer is valid until Sunday, August 21, 2016. The candle sale is two days only until Friday, August 19!